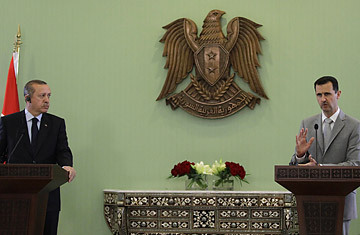 Syrian President Bashar al-Assad (R) speaks during a joint press conference with Turkish Prime Minister Recep Tayyip Erdogan at al-Shaab palace in Damascus on October 11, 2010. With neighboring Syria in crisis, the Arab Spring has finally arrived on Turkey's doorstep  and with it, one big headache for a government that has spent recent years staking its political fortunes on the region. Since coming to power in 2002, the Islamic-rooted government of Prime Minister Recep Tayyip Erdogan has sought to become a kingpin in the Muslim world, driven by shared religious sensibility and economic expansionism. Turkish ministers have jetted between Middle Eastern capitals, signing trade deals and political cooperation protocols even as long-standing efforts to join the European Union have cooled. Erdogan stepped up criticism of Israel and became a hero on Arab streets for it. Called neo-Ottomanism by some, the new foreign policy was based on the maxim "zero problems with neighbors." As long as trade flourished and business was good, the argument went, why couldn't everybody just get along. Bashir Assad's Syria  which shares a 700km border with Turkey  was a key player in this scenario. Although the two countries came to the brink of war in the late 1990s, they became close political allies under Erdogan. The two leaders holidayed together on the Turkish coast and last year, lifted visa restrictions on travel. Unlike the revolution in Egypt, where Erdogan was quick to denounce Hosni Mubarak and call for a handover, he has been largely silent on the current uprising in Syria. That parallels Turkey's response to the uprising in Libya, where Turkish companies had billions of dollars in construction contracts and some 25,000 workers. Libyan rebels have since accused Ankara  a NATO member  of supporting Muammar Gaddafi's regime. Yet, despite strong economic ties, Erdogan does not appear to have the ear of either Assad or Gaddafi. "Turkey styled itself as a 'wise elder' and role model in the region, but when push comes to shove, it has become apparent that it has little influence over what is happening," says Soli Ozel, international relations professor at Bilgi University and a political columnist. "This is the point where Turkish foreign policy hits the wall." "In pursuing its economic interests in a region such as the Middle East, where the state is heavily involved in economic decision making, Turkey has had to create strong bonds with many  though not all  existing regimes, " wrote Turkey expert Henri Barkey in an article for the Carnegie Endowment for Peace. "Paradoxically, these linkages have made Turkey into a status-quo power, unwilling to see dramatic change. And not surprisingly, first Libya, and now Syria, is creating serious headaches for Turkey." In addition to being a political embarrassment for Ankara and its ambitions, the worsening turmoil in Syria could have serious political consequences for Turkey  most worryingly, a mass influx of refugees across the border. Senior Turkish government negotiators traveled to Damascus on Thursday to urge reform, while the Turkey's National Security Council met in Ankara to discuss the crisis. "It is important that necessary steps are taken rapidly and in a determined way in order to establish social peace and stability in brotherly, friendly Syria, to put an end to the violence and to maintain security of life, basic rights and freedoms," a council statement said later. Erdogan's reticence in addressing the violent crackdowns on civilians in Libya and Syria has also sparked criticism that he has double-standards when he picks his fights. Just two years ago, he caused an international stir by vocally condemning Israel's killing of civilians in Gaza. Relations with Israel never recovered: Turkey has not had an ambassador in Tel Aviv for months. "Turkey now finds itself very alone on the world stage," says Ozel. "Relations with Europe have soured, and what will happen in the Middle East is uncertain. But it didn't need to be this way." Watch Turkey's unconventional Muslim minority deep in prayer.